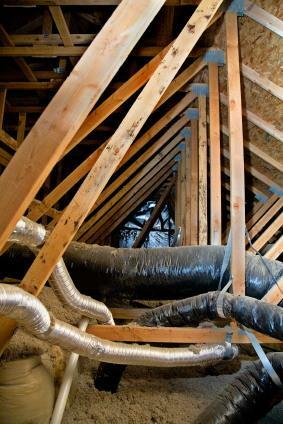 While many people are familiar with batt type insulation, attic blown-in insulation is becoming more popular every year. It has many advantages over the traditional fiberglass batts, and is easy to install in most homes. It is great for old houses because it can actually be blown into the attics and walls without a lot of trouble for the homeowner or damage to the home. There are several types of insulation for you to consider. Fiberglass insulation insulates very well. It is very important that you read instructions and follow manufacturer's recommendations carefully. If the proper application is not used, the insulation will be fluffy and will not insulate properly. This is called over-blowing, and it occurs when not enough material is used but desired depth is reached. The depth plus density recommendations should be followed closely to achieve optimum results. It does not settle over time and therefore retains its full R-value for the life of the home. Care should be taken when using the fiber glass blown-in insulation because fiberglass carries health risks. Use the proper safety equipment, including a mask and goggles, when installing fiberglass. Fiberglass is also not the best choice for areas when the temperature gets to 20 below zero in the winter. It can lose up to fifty percent of its R-value in extreme cold temperatures. Cellulose insulation is considered environmentally friendly. It is a natural wood product made from recycled newspaper. There are some toxins in the chemical additives that give the material its class-1 fire rating, however the overall health risks from attic blown-in insulation are much less than with fiberglass batts. Cellulose absorbs sound the best of any insulation, having the ability to reduce noise by up to 90 percent. It does settle during the life of the home and the homeowner will need to add more insulation as time goes on. Cellulose insulation is heavy and can only be installed to an R-30, or it can make the drywall sag. Most current recommendations are for an R-36 to R-49. If you are environmentally sensitive you should be aware that the inks contained in the recycled newspaper can outgas small amounts of formaldehyde. This is normally not enough to bother a healthy person. Rock wool is sometimes called slag wool. It is a loose-fill insulation that is similar to fiberglass. It is manufactured from blast furnace slag, a layer of impurities that form on the surface of molten metal. Using this material is good for the environment because it keeps it out of the overcrowded landfills. It is suited for oddly shaped areas of the home, around plumbing stacks, and in other hard-to-reach places. Rock wool does not settle when dry and retains its full R-value for the life of the home. Rock wool has an excellent energy performance, will not burn, and is chemically inert. It is a somewhat new type of insulation, but a very promising one. Blown-in insulation is an excellent alternative to the bulky fiberglass insulation. It performs better and has a higher R-rating than most common insulation products. Because it is loose material it can take any shape and is much easier to fit into oddly shaped spaces. This type of insulation is less expensive that the batts, and can be easily installed by a homeowner. A 1,000 square foot attic costs approximately $400 to insulate with the loose insulation, or about half the cost of the pink fiberglass. Expect that type of job to take about six hours to complete. By using the blown-in insulation you can expect to save about 20 to 50 percent on your heating and cooling costs. This insulation can be easily installed over existing fiberglass batts to increase the energy savings of your home. Determine the square footage of your attic by multiplying length by width. Cover the attic access with cardboard to keep it free from fiber. Use the 10-inch flashing to block recessed lighting fixtures. Maintain at least three inches of air space between the fixture and the flashing. Install flashing around heat generating fixtures such as chimney flues. Put rulers up in several areas so you know when optimum depth has been reached. Put on goggles and mask. Load the hopper of the blower with insulation. Keep hopper full for best results. Work your way from the farthest corner of the attic. Be careful not to cover eave vents. Check the depth of the insulation. Check to make sure you have used the recommended number of bags. Adding insulation is a great home improvement project that can create a more comfortable home while saving you money.